About an hour and a half out of Melbourne there’s a small township that is known by the name of Fryerstown. Today, it has a population of 350, which underplays the towns historical significance. In the late 1800’s Fryerstown had a population of 15,000, all of which had flocked to the area during the Victorian gold rush. Today, nearly nothing exists of the town that used to be. Outside of Fryerstown there’s the remains of a Cornish engine house that was used to drive steam operated hardware. There’s a chapel that was constructed late in the 1800’s but no longer sees a congregation, and there’s the ‘Burke and Wills Mechanical Institute’ building – which is named like so many other things in Australia after bearded white guys that did sh*t. In this case the bearded white guys – Burke and Wills – were two men that died in the process of trying to cross through the centre of Australia and back in an over-funded and under-organised expedition that ended up failing because A: people are impatient and crap communicators, and B: Burke and Wills were racist idiots that instead of taking the offer by the local Aborigines to help them when they were on death’s door from starvation, they chose to simply die instead. Today Burke and Wills’s stupidity heroics are honoured all over the countryside with all kinds of monuments. rock piles, sculptures and even mechanics institutes. Is 1975 Fryerstown was a fading blip on the landscape. That year the local post office closed its doors as much of what was of value in the landscape was being sold up and parcelled off. 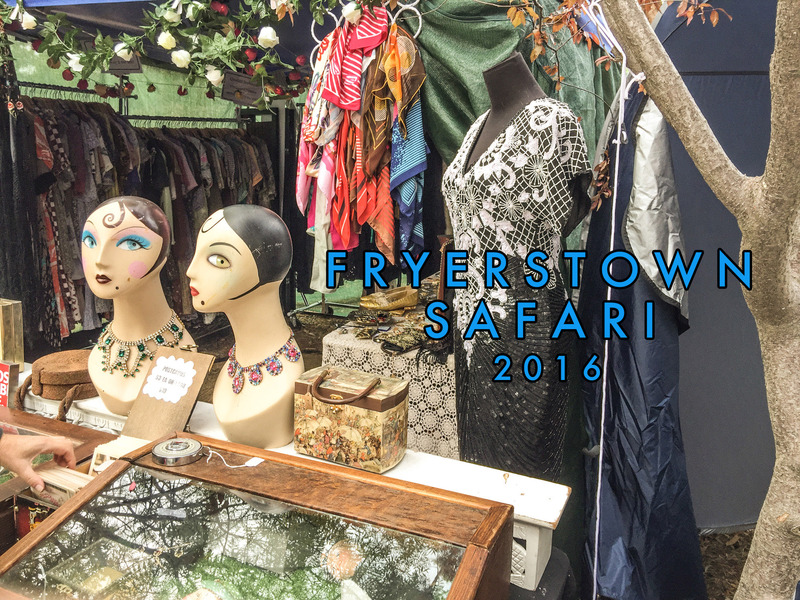 It was in this climate that the Fryerstown Antique Fair began – which is known as the largest of its kind in Australia, and stallholders are known to travel from all over the country to trade here. Last year Miss Jane and I weren’t in Australia to attend the fair, so this year we took the opportunity to hop into Ruby the Exxy and head out onto the road and into the hills to check it out. Two days before the fair was due to start the Victorian countryside was battered with heavy rain and a series of cold summer storms, and we knew that it would significantly impact the amount of stalls that were going to be there but still decided to go anyway. 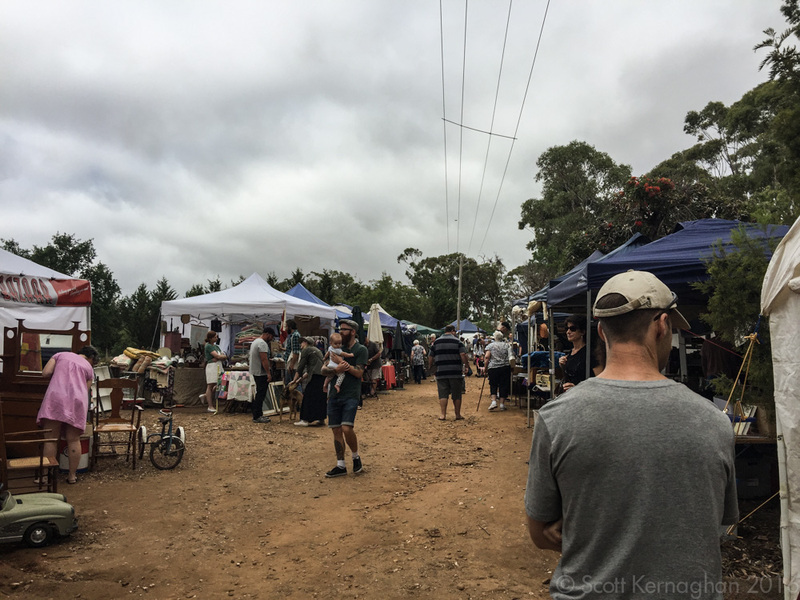 We drove up on the second day of the fair, and as we left Melbourne we watched heavy clouds roll over Mount Macedon and begin to dump much needed water across the sun-scorched countryside. However as we got closer to Fryerstown the clouds broke up a little, and we found dry roads and occasional sunshine. 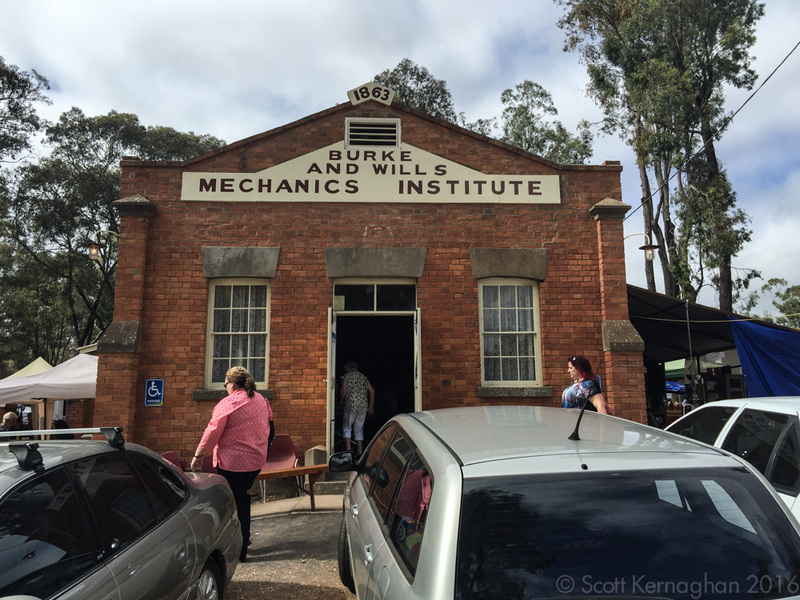 The Burke and Will’s mechanics institute – the hub of the Fryerstown Antique fair. 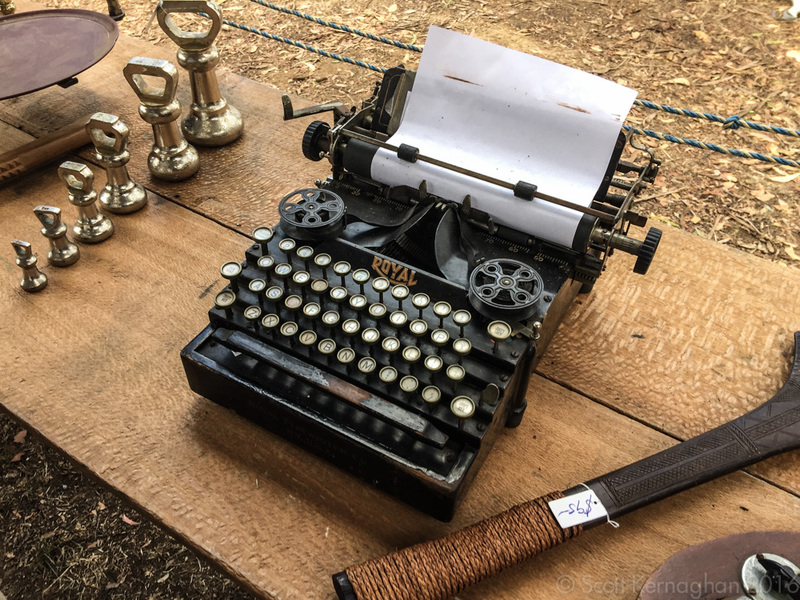 We parked in a muddy paddock near the fair and wandered down hill, where we were greeted by the scent of sausages barbecuing and an ocean of makeshift stalls that had been constructed into into countryside under tarps and temporary marquees. By the second day in everything was looking muddied and dirtied, and you could tell that the sellers were tired and worn out. You could tell the next 2 and a half days were going to be a struggle for them. 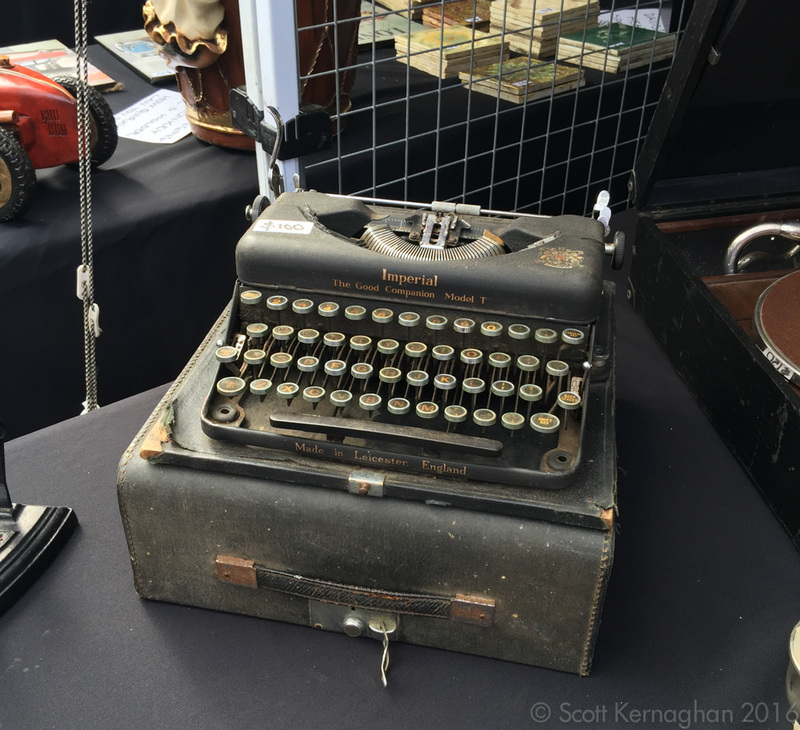 I’ve been to a few typewriter fairs across Victoria now, and I’ve found that mostly typewriters don’t feature as much, so I wasn’t expecting to see many. But oh, how wrong was I! I found a lot of amazing things there, and I won’t dull you with the excessive photographs. But there were a surprising amount of typewriters there. First up was a Pinnock. Which I didn’t photograph because I really didn’t feel inclined to waste my time with a 70’s era plastic ugly was was selling for…. $110. 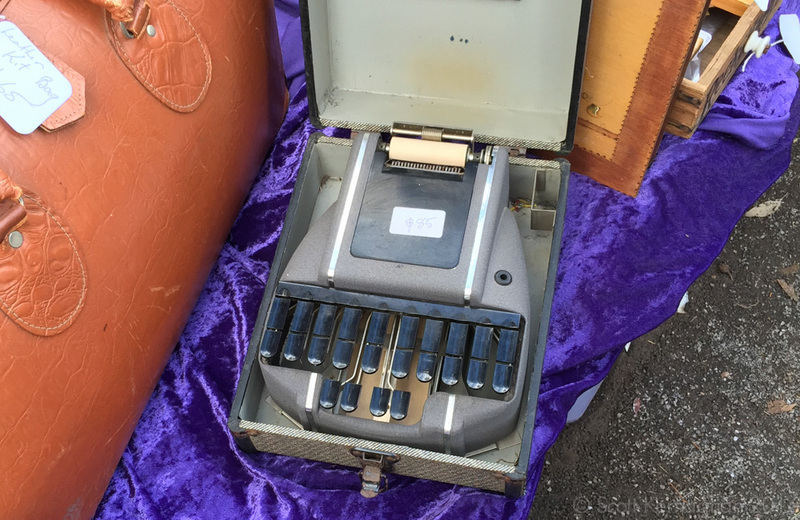 However, in the same stall there was a great little Stenograph that was selling for $85. Quirky, but I don’t collect these. 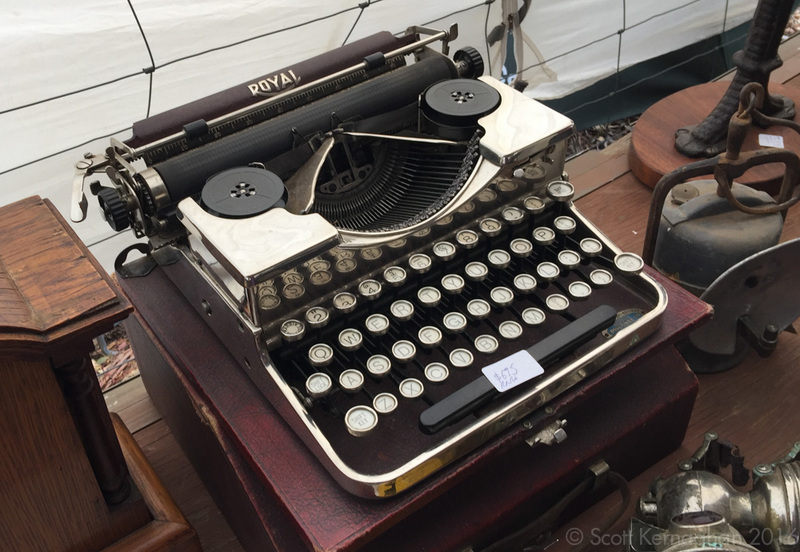 Next up I found a great Royal Kmm desktop that I was seriously tempted to buy – if anything because it didn’t have a wide carriage, as 95% of the desktop machines I have spotted in Australia do. It was also selling for $90. $90? Maybe not. It’d clean up nicely. But no. Next up I came across an Imperial Good Companion. Anyone that has corresponded with me will know that I have a distinct dislike for these machines, and while it was sitting at $55, I was pretty sure it wasn’t coming home with me today. IGC…. For people that like looking at a bulkhead. Much to my surprise I next came across a machine that I had seen before. It was a Royal P that had been on ebay several months before, that sold for about $450 on there. 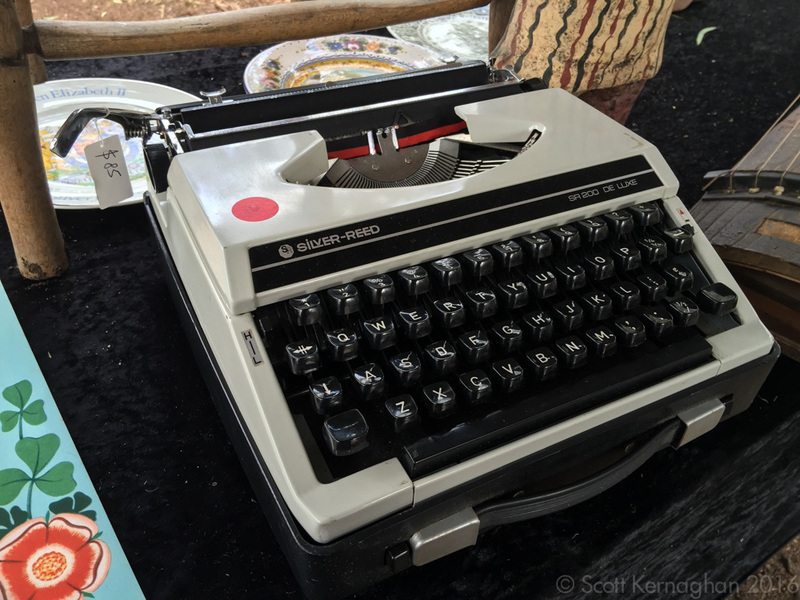 For those that hadn’t seen this machine, it was a typewriter that someone over in Adelaide had attempted to dress up and chrome plate to try and replicate my own Chrome Writer (which you can read about here). 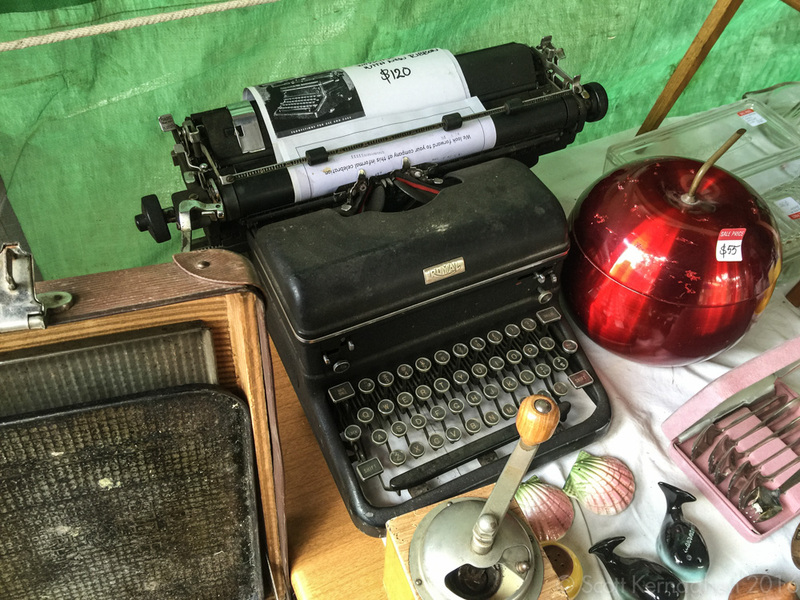 Sadly, the people that chromed up this machine and worked on it had neither the patience or the attention of detail that I had when re-building my machine, and as such the typewriter looked second-rate. The seller here had it stickered it as ‘rare’, and was selling it for $695. Not the real Chrome Writer. I have to give them credit however, as they’ve tried to take a good crack at making a Chrome Writer. Sadly the machine was incomplete, and ran a little rough. But I do like the red crocodile case, and I’m in two minds about the red crocodile paper table that they couldn’t remove to plate. But it sadly was a bit of a reminder of how beautiful the donor machine was that this chromed machine was made out of. Next up was an Olivetti Studio 44. 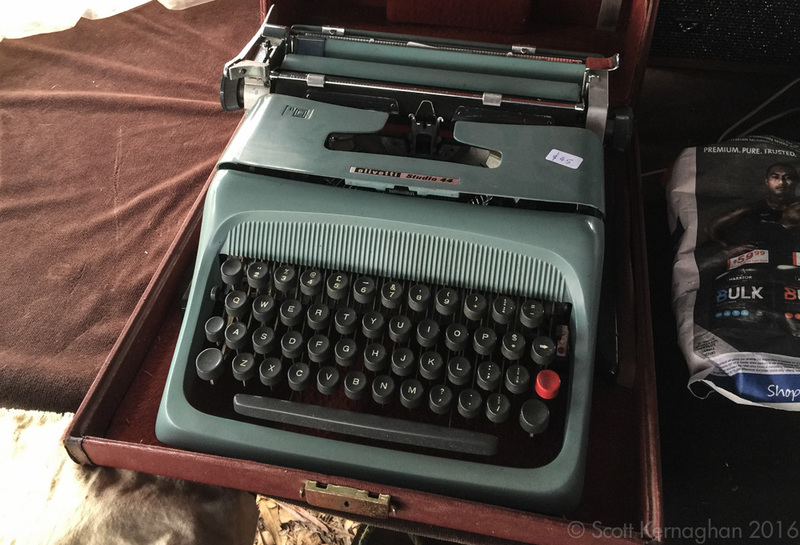 At $65 is was… well… probably a fair buy for someone that wanted to get into writing on a typewriter. But had no pizzazz to attract me to it. Studio 44. For those that like their passion bland. 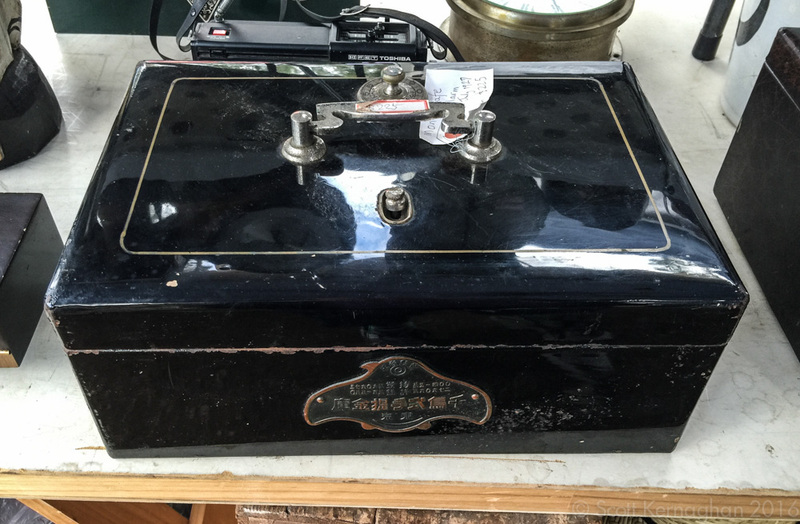 One non typewriter item that came very close to coming home with me was an mechanically alarmed Japanese desk safe. It was a bit over $200, but it just looked incredible. It had a mainspring which was wound up to provide power to the alarm, which would operate for several minutes. There was a smaller alarm to notify of when someone opened the up the top of the box, and a second alarm that would trigger when the safe was picked up and run continuously till the spring ran out, or you turned it off. It looked… beautiful. Try to open me.. Just try. 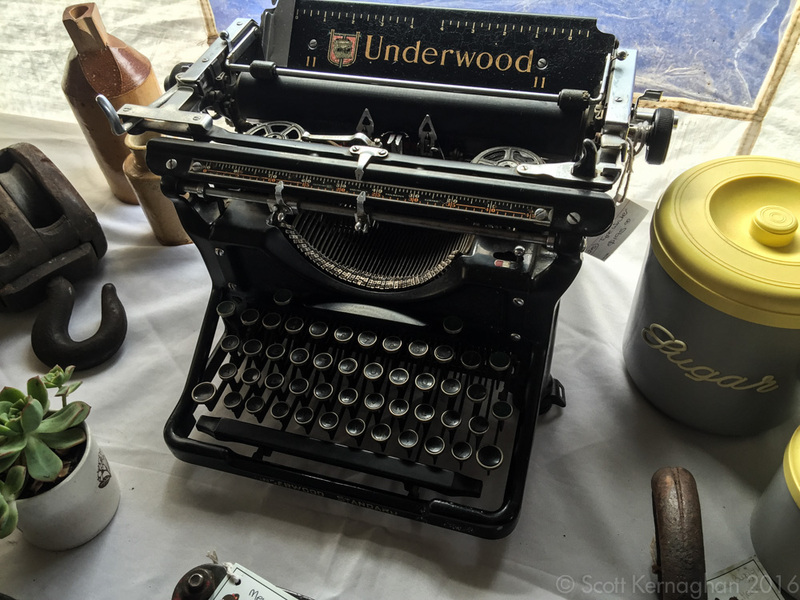 And Underwood 5 with a cork platen that the seller was asking $195 for made an appearance. Nice, but not compelling enough to come home with me. Especially at that price. An early version Lettera 22 was quite tasty. Note the Embossed Olivetti logo that is on the paper table. This is a design that was placed on the L22 for the first couple of years of manufacture. 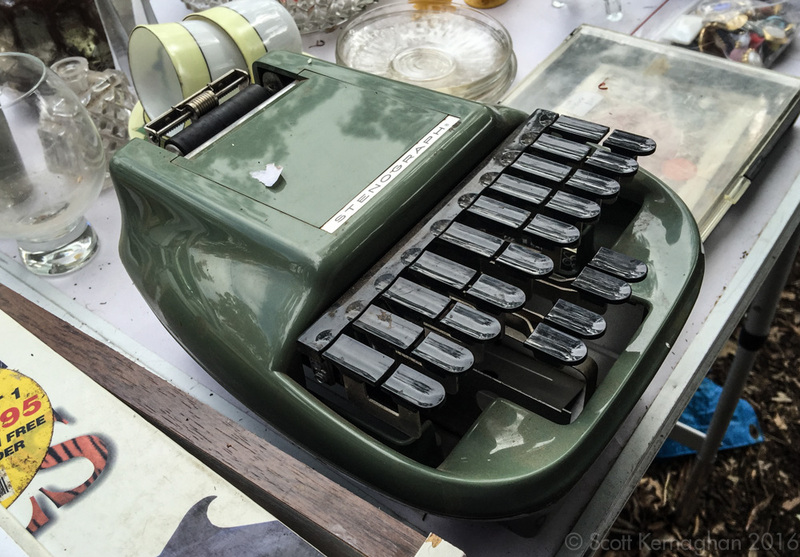 From then on the Aluminium slip with the branding painted onto it became the standard as Olivetti started to sell these machines through other retailers that sometimes wanted to re-badge them. 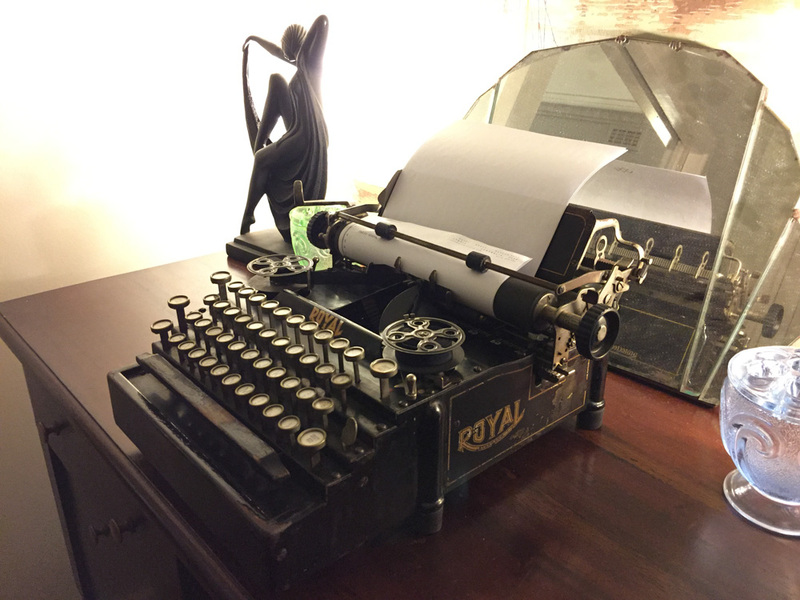 Lettera 22 – early model. An interesting curiosity was a typewriter case the I came across. It had a wooden base, but no branding on the case itself. 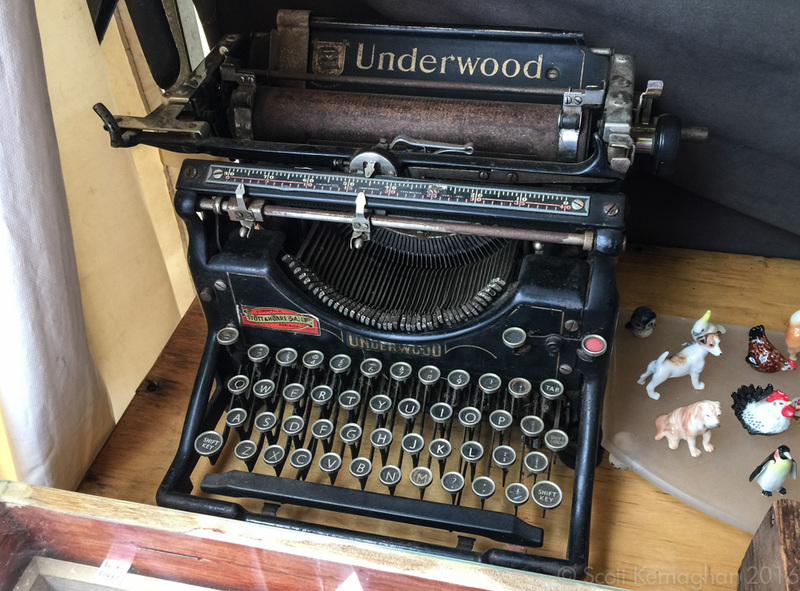 It didn’t match the Underwood or Remington styles that I had seen in the past, so I was a little unsure as to what machine it belonged to. The seller themselves had even less of a clue did, so there was no use asking them there. They were wanting $120, and as I was unsure what machine went inside, i simply left it there. Next, an Underwood ’11’ made an appearance. And while it looked in great shape, at $265 I didn’t spend long fussing over it. A great looking underwood 11 that was in beautiful working condition. 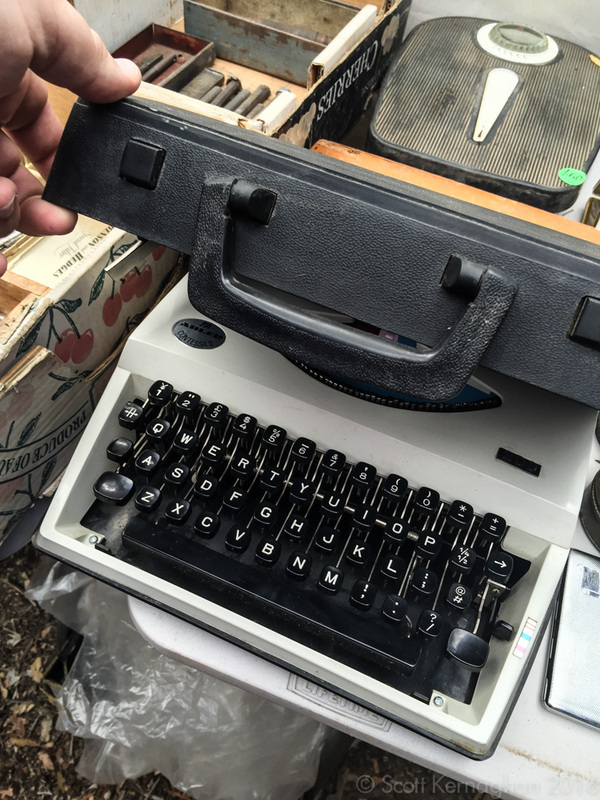 Another stenograph was found in another stall, and at $65 was genuinely interesting. But as I said earlier, I still don’t collect these. And as such I left it aside. Hidden down the back of the fair was a shop selling all kinds of odd bits in a very nicely presented store. 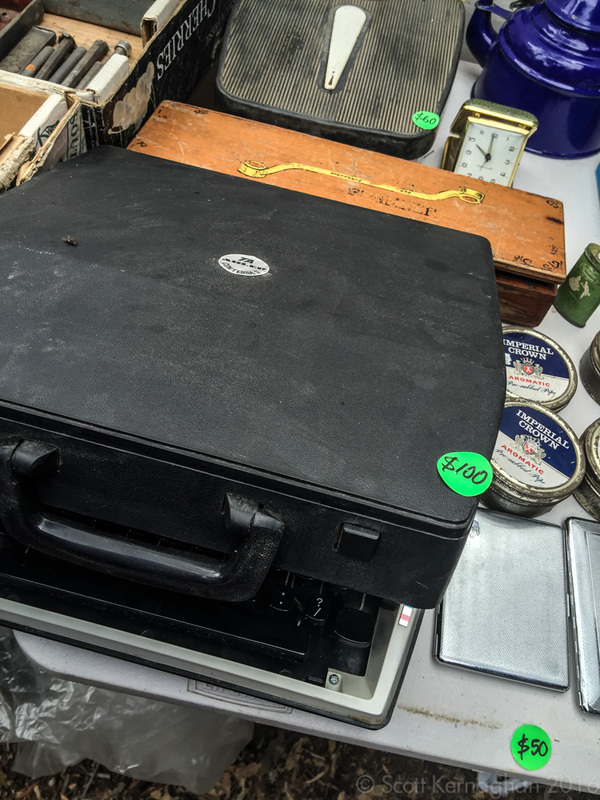 They even featured an Imperial Model T that was in… well… dirty but salvageable condition, and was selling at $100. Which still got the big ‘Nup’, even though it was a more interesting machine than the one I spotted earlier. Another IGC. For those that like the bulkheads with enamel keys. And then there was the machine that seriously tested the fortitude of my wallet. It was a Royal 5 flatbed, that was being sold by a seller that had Travelled from the Gold Coast. And was in gummy but surprisingly good operating condition. I knew that I would have it working with a little cleaning to free up the mainspring which had been inappropriately piled and was causing the machine to operate very slowly. The seller wanted $175 for it. While this seems expensive compared to these other machines, the Flatbed 5s are very thin on the ground here in Australia, and this is actually considerably below what an operating machine in fair order sells for. Even more interesting was that it had near brand new feet on it, and the platen had been recovered. Weirdly, not the bails though. 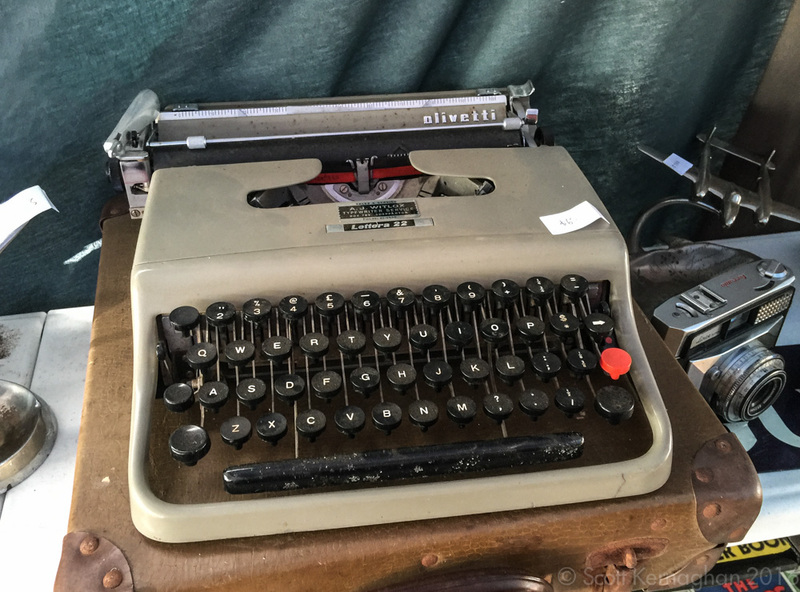 The same seller had two other typewriters. An Oliver Courier and a Silver Reed in white. 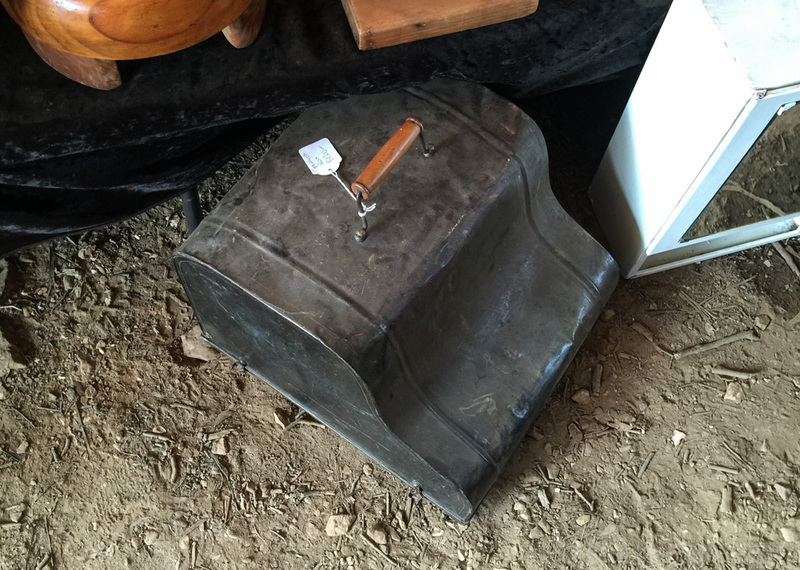 Oliver Courier – which he was selling for $120. Silver Reed – which I think he was selling for $85. 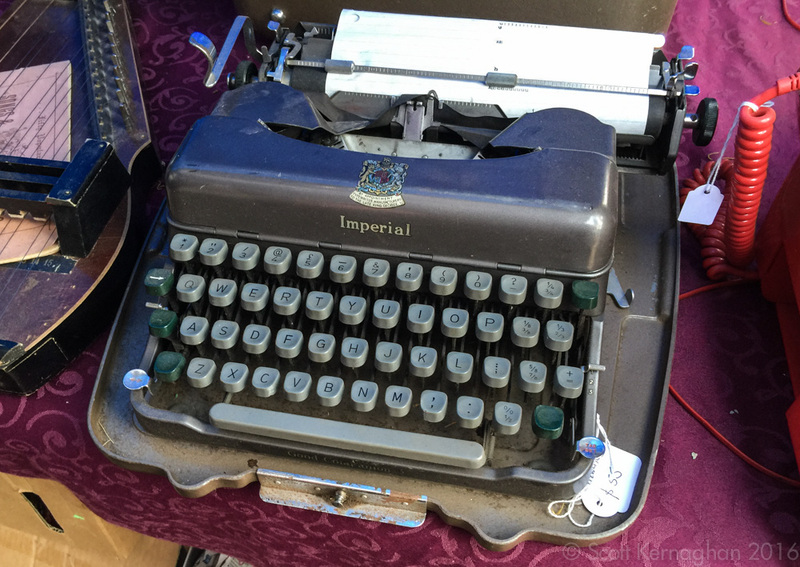 In another stall I found a Mettype toy index typewriter, and another Royal – this time with the unfortunate wide carriage that makes these as common as possum-poo, and about as desirable. At $65 and $120 they were pretty much going to stay exactly where they were. Big, beautiful and too much for me to shelve. 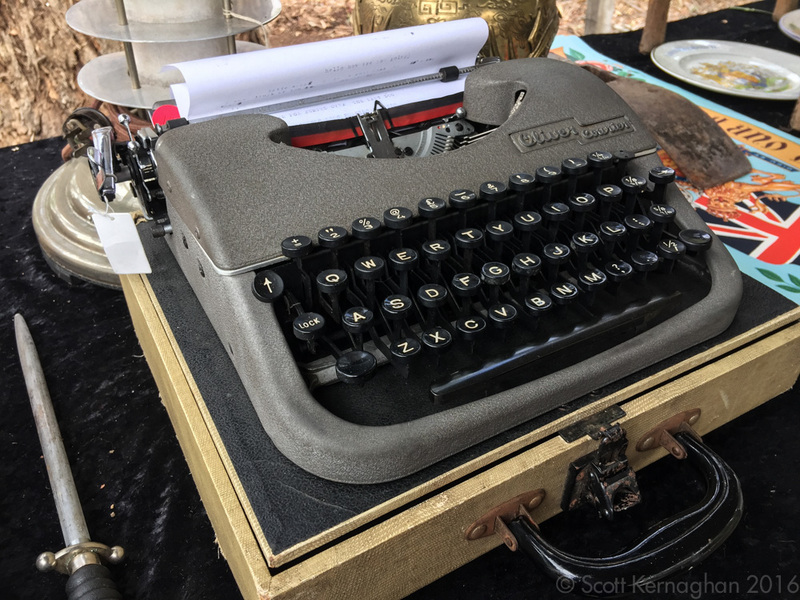 As the close of the typewriter hunt finished for the day, I came across one last machine – an Litton Adler ‘Contessa’ – an absurdly common machine that is no great typewriter. Its actually the a ‘Tippa-S’, but for some reason had an Adler Contessa sticker on it. Truth be told the word ‘Absurd’ should have been given to the price the guy was asking for it rather than describing how common this machine is. Oh get f****d… seriously? $100? I think this typewriter looked much nicer at my place than on a dirty old table. ← No user serviceable parts: the death of being able to do. Sounds like a neat place, if one enjoys history. I think you made the best choice out of all of them. 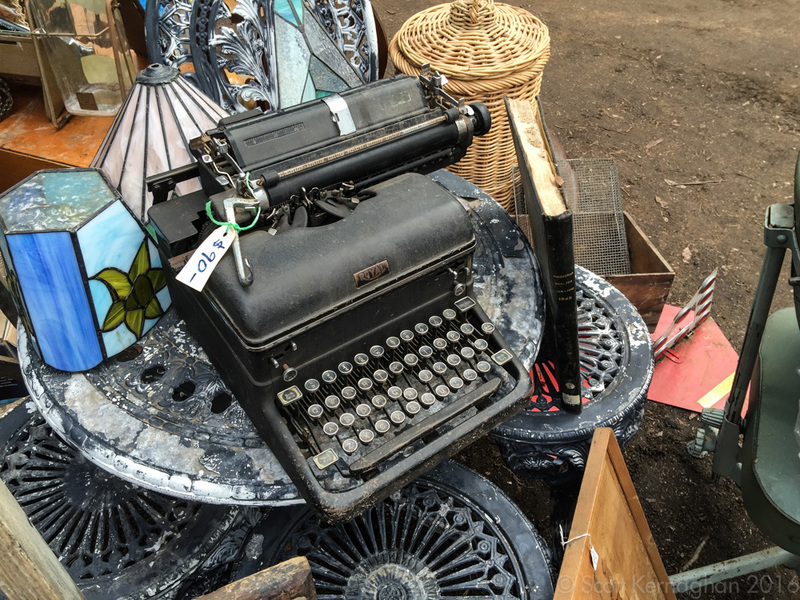 That’s still more typewriters than what I usually see around my neck of the woods. Very nice, Scott. Those old red-crackle Royal P’s are special, that was kind of sad. To do chroming right here in the ‘States, it would run me about $250 USD to do the body, ribbon cover, back panel and paper table on a 50’s S-C Sterling. Not going to happen, as much as I wanted to. So I think I’m going to powder-coat it instead. I never see Oliver portables or IGC’s in my journeys in the USA. As crappy as the latter may be, I’d still like to lay my hands on one. If I ever head over to Australia for work, I’ll be sure to coordinate some kind of ‘prisoner exchange’ with you – common machines in our respective lands, swapped to make the other happy. And come up to my place as I have a few as well! 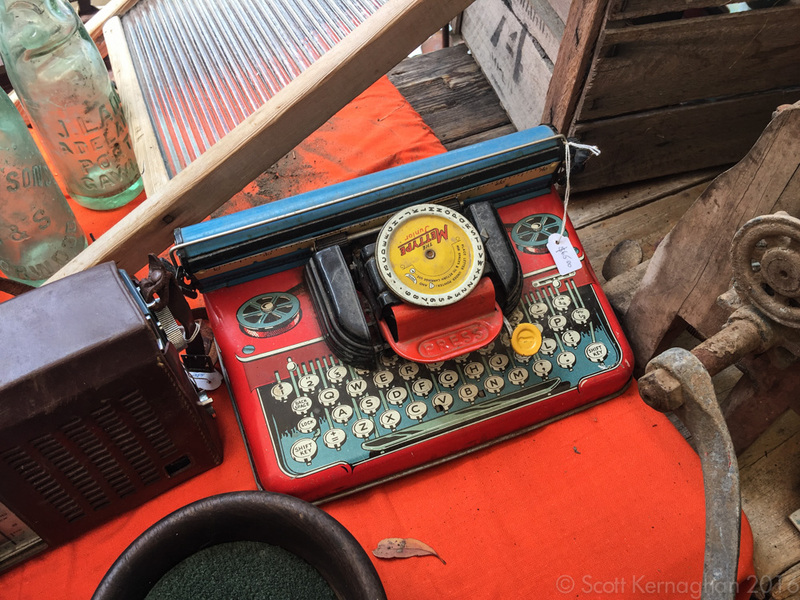 I really enjoyed the safari – it’s so interesting to see the typewriters (and their pricing) in other parts of the world. And congratulations on the working Royal flatbed – I’d like to bring one of those home if I can find one locally. Entertaining safari! Congrats on your new flatbed. As Brian said, we hardly ever see IGC’s in the States. I would have snatched up that no. 3. As with these market prices, it just smacks of desperation, to my eye. Only deal with professionals on the Typosphere, I say.